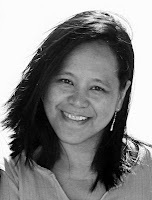 I'm Filipino-American Christian who now lives (and crafts) in Croatia! Thanks for stopping by! Most of them were given to me as gifts (I have very generous friends and family :)). I hope to be able to use these neglected supplies and show my cards in future posts. I started yesterday with the beautiful Spring Bouquet stamp from Flourishes. For my card below, I used Papertrey Ink's Rosie Posie stamps. The sentiments is Waltzing Mouse's Blessed By You set. I love the sentiments in this set. The papers were my favorite papers last year, Crate Paper's Emma's Shoppe, and these are the last remaining sheets from that collection. The pearls are by Want2Scrap. I'm entering this to Flourishes Lovely in Lace Challenge. Here's CARD #2 that is super simple. It's perfect for the CAS-ual Friday challenge, which is being sponsored by The Craft's Meow. And the flowers are perfect for the Simon Says Stamp Challenge as well. 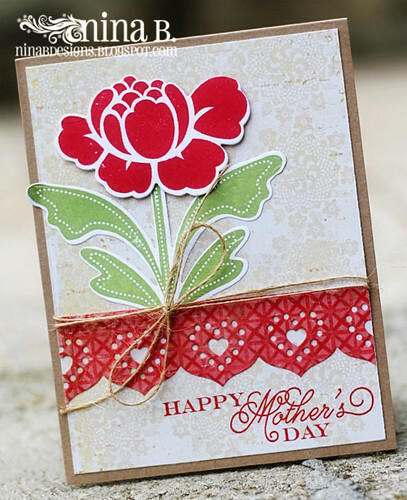 I accented the flower with a border die cut using Spellbinders Edgeabilities dies. The sentiments is from The Craft's Meow's Mother and Father set. 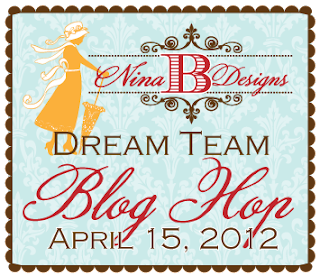 See you all back here on Sunday for the NinaB Designs' Blog Hop with lots of inspiration and prizes! Have a great weekend! 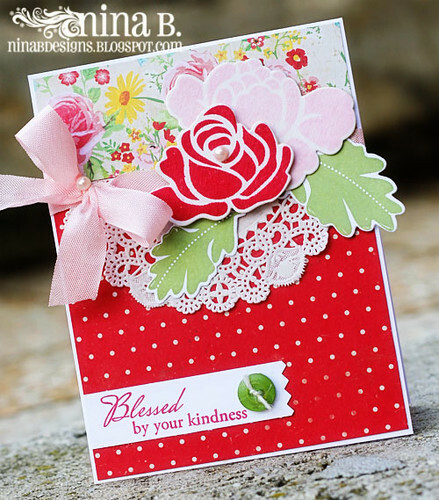 Gorgeous cards, Nina! I love the bright and sunny colors! Have a nice weekend! Gorgeous cards Nina!! Glad you have the TCM girls playing along at CAS-ual Fridays! These really are so bright and cheerful, perfect for mother's day! WOW.. this is amazing! that bright red just pops.. Your Mother's Day cards are so cheerful and lovely Nina. So glad you're getting the chance to use some of those gifts. The two cards that beautiful ... I love your style! Vibrant and cheery, very sweet. Thanks for playing in Flourishes challenge. Wow, gorgeous cards!! I love the beautiful colors you used. Lovely stamping and embellishments!! Such simple, bold stamps used to great effect. Love them. This is gorgeous! Glad you're joining us at CAS-ual Fridays! All content, including photos, freebies, images and text, are copyrighted by Nina C Brackett. Feel free to be inspired by them and use the freebies, but please give proper credit by linking to my blog. All freebies are for your own personal use only. Don't share them with others in any form whatsoever, but direct your friends to my blog to get their own copy. Please email me with any questions. Thanks. Crafting in Croatia by Nina Brackett/NinaB Designs is licensed under a Creative Commons Attribution-NonCommercial-NoDerivs 3.0 Unported License. Pretty Princess Owl and Exciting news! Birthday Girl Vespa, Winners and a little peek! Happy 1st birthday, Lily Pad!